Ryan Mallett (born June 5, 1988) is an American football quarterback who is currently a free agent. He was drafted by the New England Patriots in the third round of the 2011 NFL Draft, and has also played for the Houston Texans and Baltimore Ravens. He played college football at Arkansas. Mallett graduated from Texas High School in Texarkana, Texas, and was ranked as the #2 quarterback and #4 overall player in the nation by Rivals.com. He was also the Gatorade Player of the Year in Texas in 2006. Mallett participated in the U.S. Army All-American Bowl in 2007 and won the Glenn Davis Army Award as the best player on the West team. He chose to play at Michigan over Alabama, Arkansas, Florida State, Nebraska, and Texas. Mallett made his first appearance at Michigan in the second game of the 2007 season against Oregon. He entered the game for the injured Chad Henne in the third quarter and completed 6 of 17 passes for 49 yards and one interception. Mallett started the next week against Notre Dame and led the Wolverines to a 38-0 victory by throwing 3 touchdown passes, going 7/15 (46.7%) for 90 yards. Mallett started his first Big Ten conference game against Penn State the following week. He went 16/29 (55.2%) with 170 yards and one interception. He also scored on a 10-yard rush in the first quarter. Henne returned to start the Wolverines' next three games. In those games, Mallett had limited playing time completing 4/10 for 30 yards. Mallett's next start was against Minnesota. He threw a touchdown pass and went 11/20 (55.0%) with 233 yards and no interceptions. Mallett did not start, but played extensively the next week in a loss against Wisconsin. He threw 3 touchdown passes and went 11/36 (30.6%) with 245 yards and two interceptions. In the fourth quarter, Mallett threw a 97-yard touchdown pass to Mario Manningham, the longest pass completion in Michigan history. Mallett played very little in the next week's game against Ohio State. He threw three passes and completed one of them for eight yards. Overall, he finished the 2007 season with 892 passing yards, seven passing touchdowns, and five interceptions. Mallett's place at Michigan was in question after new head coach Rich Rodriguez was hired to replace retiring coach Lloyd Carr because of the style of offense Rodriguez ran at West Virginia. Rodriguez chose to overhaul Michigan's offense and installed a "spread" read option offensive scheme, which did not fit Mallett's skills as a drop-back, pocket quarterback. Rodriguez unsuccessfully courted Terrelle Pryor to run Michigan's offense. Mallett and his family maintain he was open to staying at Michigan had Rodriguez been open to utilizing his skill set as a pro style passer. On January 14, 2008, Mallett enrolled at the University of Arkansas, where he was ineligible to play during the 2008 season due to NCAA transfer policies. In 2009 as a redshirt sophomore, Mallett began his career as an Arkansas Razorback, under the direction of head coach Bobby Petrino. Prior to the 2009 season, Mallett was named by ESPN's Bruce Feldman as one of college football's top 10 newcomers of the year, citing his arm strength as a major determining factor. In subsequent interviews, when Mallett was questioned about how far he could throw the football, he said farther than 80 yards. On March 1, 2009, he was arrested on charges of public intoxication. He pleaded guilty to the misdemeanor charge on April 3, 2009 and paid $155 in court costs, fines, and fees. Mallett was also punished by Coach Petrino with early wake up calls, extra running, and early curfews. Mallett earned the starting job in the Razorbacks' first game against Missouri State, going 17-of-22 for 309 yards and a touchdown. Two weeks later, Mallett passed for 408 yards and five touchdowns against Georgia in a losing effort. The passing yardage and touchdowns were single game school records.Ryan threw for more than 250 yards in three of Arkansas' next five games, with nine touchdowns against three interceptions. Impressive victories over Texas A&M and Auburn were coupled with tough losses to Alabama and Ole Miss, and a loss to Florida. After a dismal 3-4 start, Mallett led Arkansas to three consecutive victories over Eastern Michigan (14-of-16 for 248 yards and three touchdowns), South Carolina (23-of-27 for 329 yards and one rushing touchdown), and Troy (23-of-30 for 405 yards, five touchdowns and one interception). Over those three games, he completed 83.1% of his passes, and had a quarterback rating of 165.05, which was third-best in the nation. The victory over Troy pushed Arkansas' record to 6-4 and secured the Hogs' bowl eligibility, with games against Mississippi State and LSU remaining. Mallett went on to throw for 313 yards and matched his career high of five touchdown passes in a 42-21 victory over Mississippi State. The following week, he threw for 227 yards and a touchdown in a 33-30 overtime loss to LSU in Baton Rouge. Ryan was named to the All-SEC 2nd Team squad by the coaches and the AP for his performance during the season, behind Florida QB Tim Tebow despite superior passing statistics. The Razorbacks finished the 2009 season with an 8-5 record and won the 2010 Liberty Bowl against East Carolina, 20-17 in overtime. 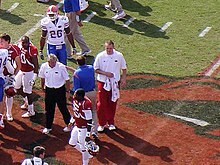 Mallett was named the bowl game's Offensive MVP. Mallett currently owns sixteen school records, including most passing yards in a season (3,627), most consecutive passes without an INT, most passing yards in a game (408), most passing touchdowns in a game (5 - three times), only quarterback to pass for over 400 yards in a game (two times), most pass plays of 25 or more yards in a season, and most passing TD in a single season (30). Mallett chose to forgo entering the 2010 NFL Draft, and return for his junior season at Arkansas. Mallett was considered among the top five quarterbacks if he had entered the draft. 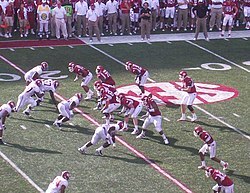 Mallett receiving a snap against Alabama in 2010. It was announced on February 17 that Mallett had suffered a left foot injury in a change of direction conditioning drill. The junior had successful surgery later that day, and a planned second surgery was announced on June 9. Mallett missed the Razorback spring game and spring drills, but he did not miss fall camp. During the off season, Mallett was named one of college football's most irreplaceable players by ESPN.com, and he appeared on College Football Live. 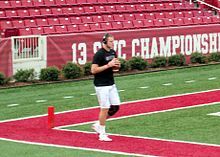 At the SEC's 2010 Media Days conference, Mallett became the first Arkansas quarterback to be named preseason first-team All-SEC by the SEC coaches. He was listed as the frontrunner for the Davey O'Brien Award by The Sporting News and a potential Heisman Trophy candidate. He was also named a preseason All-SEC quarterback and preseason All-American quarterback by numerous organizations. Mallett's performance in 2009 led to higher expectations in 2010. The junior stated that he wished to change the mindset of Arkansas fans into that of a winning program. The confident Mallett was quoted saying, "I'm looking for 14," when asked about how many wins the 2010 Razorbacks could achieve. On September 4, 2010, Mallett completed 21-of-24 passes (87.5%), setting an Arkansas school record for completion percentage in a game. The completion percentage also ranks second all-time in SEC football history. Mallett contributed 301 passing yards, as well, with a total of 8 receivers recording catches. Arkansas defeated Tennessee Tech in the game 44-3. In the next game against Louisiana–Monroe, he finished with 400 passing yards, three touchdowns, and one interception. In the next game, against Georgia, he had this third consecutive game with three touchdown passes in the conference victory. Arkansas played Alabama in the next game and suffered their first setback of the season as Mallett had 357 passing yards, one touchdown, and three interceptions. The Razorbacks bounced back in the next game against Texas A&M as Mallett had 310 passing yards, three touchdowns, and one interception. After a loss to Auburn and a victory over Ole Miss, Mallett had 409 passing yards and three touchdowns in a victory over Vanderbilt. After a win over South Carolina, he had 215 passing yards and five touchdowns in a win over UTEP. After closing out the season with victories over Mississippi State and LSU, the Razorbacks faced off against Ohio State in the Sugar Bowl. In his final collegiate game, Mallett had 277 passing yards, two touchdowns, and one interception as the Razorbacks fell 31–26. Mallett finished seventh in voting for the 2010 Heisman Trophy award. On January 6, 2011, Mallett decided to forgo his senior year at Arkansas and declare for the 2011 NFL Draft where he was drafted in the 3rd round after sliding out of the first day's picks. Mallett, who was often projected prior to the draft as a first-round talent, fell to the third round of the 2011 NFL Draft, where he was selected 74th overall by the New England Patriots (using the pick they received when they traded Randy Moss to the Minnesota Vikings); that pick was the highest pick the Patriots had used on a quarterback since taking Drew Bledsoe number one overall in 1993, until they drafted Jimmy Garoppolo in the second round of the 2014 NFL Draft 62nd overall. According to Michael Lombardi of the NFL Network, the Patriots rated Mallett as the best quarterback available in the 2011 draft; nevertheless, six other quarterbacks were taken before the Patriots drafted him, drawing comparisons to Tom Brady, who was the seventh quarterback chosen in 2000, though with the 199th pick. Mallett made his preseason debut in the Patriots' first preseason game, a 47–12 rout of the Jacksonville Jaguars on August 11. He played the entire second half, completing 12 of 19 passes for 164 yards, one touchdown, and no interceptions. The Patriots scored touchdowns on each of the first four drives Mallett led, and ran out the clock on his fifth and final drive. Mallett struggled in his next preseason games throwing an interception which was returned for a touchdown in his second game. At his fourth preseason game against the Giants he was 6 for 16 for 57 yards. Mallett spent 2011 as the Patriots' third-string QB, behind Tom Brady and Brian Hoyer; Mallett was inactive for 15 out of 16 regular season games and was inactive for every post season game for the Patriots' Super Bowl run. Following the Patriots' decision to release incumbent back-up quarterback Brian Hoyer prior to the season, Mallett was promoted to second string signal caller behind Tom Brady. Mallett dressed in each of the first eight games of the season, and in their blowout 45-7 rout over the St. Louis Rams in London on October 28, 2012, Mallett took his first snaps in the NFL, completing 1/3 passes for 17 yards (his one completion to Shane Vereen) and a passer rating of 53.5. In the Patriots blowout victory against the Houston Texans in December 2012, Mallett came into the game late in the fourth quarter and threw his first interception in the NFL on a pass deflected by intended receiver Visanthe Shiancoe. Mallett was listed as the #2 quarterback on the Patriots depth chart behind Tom Brady and ahead of 3rd string quarterback Tim Tebow, Tebow would later be released by the Patriots leaving Mallett as the Patriots only backup quarterback. On August 31, 2014 Mallett was traded to the Houston Texans for a conditional sixth round pick. He would be the Texans primary backup until November 5, 2014 when Mallett was named as the starting quarterback for the Houston Texans by head coach Bill O'Brien, replacing Ryan Fitzpatrick, who was moved down one slot to 2nd on the depth chart. During Week 11 of the 2014 season, Mallett started his first game against the Cleveland Browns where he threw his first touchdown pass to J. J. Watt. He went 20 of 30 with 2 passing touchdowns and a 95.3 passer rating in the win over the Cleveland Browns 23-7. On November 23, Mallett tore his pectoral muscle against the Cincinnati Bengals, ending his season. Mallett returned in 2015, battling for the starting quarterback position against former teammate Brian Hoyer. He ended up losing the competition to Hoyer. The day after the announcement, Mallett missed the following day's practice, leading some to believe he disagreed with the decision. Mallett apologized and told head coach Bill O'Brien that he missed practice due to oversleeping. Mallett replaced Hoyer in the fourth quarter against the Kansas City Chiefs in Week 1. Head coach Bill O'Brien announced afterward that Mallett would replace Hoyer as the starting quarterback. In Week 2, he completed 27 of his 58 passes for 244 yards 1 touchdown and 1 interception and a rushing touchdown in a 24–17 loss to the Carolina Panthers. In Week 4 against Atlanta, Mallett was benched for Hoyer with the Texans trailing 42–0, and Hoyer would lead the team to 21 points in a 48–21 loss. Despite Hoyer's success in the game, Mallett was named the starter for Week 5 against the Colts. During the Colts game, Mallett was hit hard forcing him to leave for a play, (Mallet appeared able and willing to return) but was replaced by Hoyer for the remainder of the game. Hoyer threw for 2 touchdowns but also threw a costly interception to give the Colts a 27–20 victory. Before the Texans' meeting with the Dolphins on October 25, Mallett missed the team flight and was forced to fly commercial to meet with the team in Miami. On October 27, 2015, the Texans officially released him. On December 15, 2015, in the wake of quarterback Matt Schaub suffering an injury following Joe Flacco's own season-ending injury, Mallett signed with the Baltimore Ravens. On December 27, 2015, Mallett threw for a career-high 274 yards, leading the Ravens to a 20–17 upset victory over the Pittsburgh Steelers on his seventh career start after Jimmy Clausen was benched. He would promptly get a new career high the following week with 292 passing yards in the Ravens 24–16 loss to the Cincinnati Bengals. Following Schaub returning to the Atlanta Falcons to be Matt Ryan's backup and Clausen retiring from the NFL, Mallett became Flacco's primary backup in 2016, appearing in four games. He completed three of his six passes and also threw an interception. On March 9, 2017, Mallett signed a one-year contract extension with the Ravens. After Flacco suffered a concussion late in the second quarter of the Week 8 game against the Miami Dolphins, Mallet entered the game and completed 3 of 7 passes for 20 yards and 1 touchdown as the Ravens won by a score of 40–0. ^ Williams, Charean. "Texas is a breeding ground for NFL quarterbacks". star-telegram. Retrieved January 27, 2018. ^ "Oregon at Michigan Box Score, September 8, 2007". College Football at Sports-Reference.com. Retrieved January 27, 2018. ^ "Notre Dame at Michigan Box Score, September 15, 2007". College Football at Sports-Reference.com. Retrieved January 27, 2018. ^ "Penn State at Michigan Box Score, September 22, 2007". College Football at Sports-Reference.com. Retrieved January 27, 2018. ^ "Eastern Michigan at Michigan Box Score, October 6, 2007". College Football at Sports-Reference.com. Retrieved April 30, 2018. ^ "Purdue at Michigan Box Score, October 13, 2007". College Football at Sports-Reference.com. Retrieved April 30, 2018. ^ "Michigan at Illinois Box Score, October 20, 2007". College Football at Sports-Reference.com. Retrieved April 30, 2018. ^ "Minnesota at Michigan Box Score, October 27, 2007". College Football at Sports-Reference.com. Retrieved January 27, 2018. ^ "Michigan at Wisconsin Box Score, November 10, 2007". College Football at Sports-Reference.com. Retrieved January 27, 2018. ^ "Five Longest Passes in Program History". CBS Interactive. September 21, 2010. Retrieved October 20, 2010. ^ "Ohio State at Michigan Box Score, November 17, 2007". College Football at Sports-Reference.com. Retrieved January 27, 2018. ^ "Ryan Mallett 2007 Game Log". College Football at Sports-Reference.com. Retrieved April 30, 2018. ^ "Mallett transfers from Michigan to Arkansas". SI.com. Retrieved January 27, 2018. ^ "Top 10 newcomers". ESPN.com. ^ AOL. "Sports News & latest headlines from AOL". AOL.com. ^ "Arkansas QB Ryan Mallett arrested for public intoxication". USA Today. March 1, 2009. Retrieved May 23, 2010. ^ "Missouri State at Arkansas Box Score, September 5, 2009". College Football at Sports-Reference.com. Retrieved January 27, 2018. ^ "Georgia at Arkansas Box Score, September 19, 2009". College Football at Sports-Reference.com. Retrieved January 27, 2018. ^ "Texas A&M vs Arkansas Box Score, October 3, 2009". College Football at Sports-Reference.com. Retrieved April 30, 2018. ^ "Auburn at Arkansas Box Score, October 10, 2009". College Football at Sports-Reference.com. Retrieved April 30, 2018. ^ "Arkansas at Alabama Box Score, September 26, 2009". College Football at Sports-Reference.com. Retrieved April 30, 2018. ^ "Arkansas at Ole Miss Box Score, October 24, 2009". College Football at Sports-Reference.com. Retrieved April 30, 2018. ^ "Troy at Arkansas Box Score, November 14, 2009". College Football at Sports-Reference.com. Retrieved January 27, 2018. ^ "Mississippi State at Arkansas Box Score, November 21, 2009". College Football at Sports-Reference.com. Retrieved January 27, 2018. ^ "Arkansas at Louisiana State Box Score, November 28, 2009". College Football at Sports-Reference.com. Retrieved January 27, 2018. ^ "Liberty Bowl - East Carolina vs Arkansas Box Score, January 2, 2010". College Football at Sports-Reference.com. Retrieved April 30, 2018. ^ "Liberty Bowl - East Carolina vs Arkansas Box Score, January 2, 2010". College Football at Sports-Reference.com. Retrieved January 27, 2018. ^ Higbee, Zack. "Mallett injury update." February 17, 2010. Article. Retrieved July 21, 2010. ^ Smith, Bill. "Successful Surgery for Mallett." February 18, 2010. Article. Retrieved July 21, 2010. ^ Higbee, Zack. "Statement from Head Coach Bobby Petrino." September 6, 2010. Article. Retrieved July 21, 2010. ^ Low, Chris. "The SEC's most irreplaceable players." ESPN.com. January 6, 2010. Article. Retrieved July 21, 2010. ^ Low, Chris. "Coaches preseason All-SEC team." ESPN.com. June 20, 2010. Article. Retrieved July 21, 2010. ^ a b Schroeder, George. "QB Mallett eager to bring SEC glory to long-suffering Razorbacks." Sports Illustrated. June 21, 2010. Article. Retrieved July 21, 2010. ^ "Tennessee Tech at Arkansas Box Score, September 4, 2010". College Football at Sports-Reference.com. Retrieved January 27, 2018. ^ "Louisiana-Monroe at Arkansas Box Score, September 11, 2010". College Football at Sports-Reference.com. Retrieved January 27, 2018. ^ "Arkansas at Georgia Box Score, September 18, 2010". College Football at Sports-Reference.com. Retrieved January 27, 2018. ^ "Alabama at Arkansas Box Score, September 25, 2010". College Football at Sports-Reference.com. Retrieved January 27, 2018. ^ "Arkansas at Texas A&M Box Score, October 9, 2010". College Football at Sports-Reference.com. Retrieved January 27, 2018. ^ "Vanderbilt at Arkansas Box Score, October 30, 2010". College Football at Sports-Reference.com. Retrieved January 27, 2018. ^ "UTEP at Arkansas Box Score, November 13, 2010". College Football at Sports-Reference.com. Retrieved January 27, 2018. ^ "Sugar Bowl - Ohio State vs Arkansas Box Score, January 4, 2011". College Football at Sports-Reference.com. Retrieved January 27, 2018. ^ Taylor, John. "Cam Newton runs away with the Heisman." December 11, 2010. Article. Retrieved December 11, 2010. ^ "Arkansas QB Mallett declares intention to enter NFL draft". ^ "Mallett's stock, character trending up as draft approaches". ^ "2011 NFL Draft Listing". Pro-Football-Reference.com. Retrieved January 27, 2018. ^ "Perfect fit for Mallett?". NFL.com. ^ "'Mallett 6' script waiting to be written". ^ "Watch Jacksonville Jaguars vs. New England Patriots [08/11/2011] - NFL.com". www.nfl.com. Retrieved January 27, 2018. ^ Ulman, Howard (August 12, 2011). "Gabbert inconsistent at best in NFL debut for Jaguars". AP. Retrieved August 12, 2011. ^ "New England Patriots at St. Louis Rams - October 28th, 2012". Pro-Football-Reference.com. Retrieved January 27, 2018. ^ "Houston Texans at New England Patriots - December 10th, 2012". Pro-Football-Reference.com. Retrieved January 27, 2018. ^ "Tim Tebow cut by Patriots as QB failed to take advantage of great opportunity". ^ "Patriots trade Ryan Mallet to Houston Texans". Washington Post. August 31, 2014. Retrieved August 31, 2014. ^ "Houston Texans at Cleveland Browns - November 16th, 2014". Pro-Football-Reference.com. Retrieved January 27, 2018. ^ "QB Ryan Mallett done for season". ESPN.com. November 24, 2014. Retrieved November 24, 2014. ^ "Kansas City Chiefs at Houston Texans - September 13th, 2015". Pro-Football-Reference.com. Retrieved January 27, 2018. ^ "Houston Texans at Carolina Panthers - September 20th, 2015". Pro-Football-Reference.com. Retrieved January 27, 2018. ^ "Houston Texans at Atlanta Falcons - October 4th, 2015". Pro-Football-Reference.com. Retrieved January 27, 2018. ^ "Indianapolis Colts at Houston Texans - October 8th, 2015". Pro-Football-Reference.com. Retrieved January 27, 2018. ^ "Ryan Mallett Has to Fly Commercial After Missing Team Flight to Miami". Complex. ^ "Houston Texans release QB Ryan Mallett". NFL.com. October 27, 2015. Retrieved October 27, 2015. 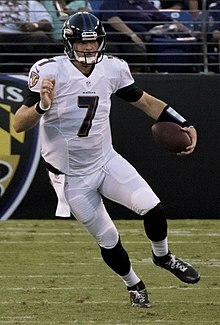 ^ "Ravens, Ryan Mallett shock Steelers". espn.com. December 27, 2015. Retrieved December 27, 2015. ^ "Watch Baltimore Ravens vs. Cincinnati Bengals [01/03/2016] - NFL.com". www.nfl.com. ^ "Ryan Mallett 2016 Game Log". Pro-Football-Reference.com. Retrieved January 27, 2018. ^ Mink, Ryan (March 9, 2017). "Reports: Ravens Retaining Backup Quarterback Ryan Mallett". BaltimoreRavens.com. ^ Ginsburg, David (October 27, 2017). "Ndamukong Suh Chokes Ryan Mallett [VIDEO]". detroit.cbslocal.com. Retrieved October 27, 2017. Wikimedia Commons has media related to Ryan Mallett.